When I was in Philippines a month ago I didn't get a chance to eat much bihon. So, I decided to make bihon this weekend. 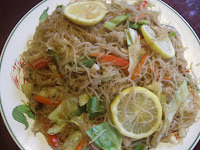 Most Filipinos know that Bihon is very popular in the Philippines. They usually make this with lumpia, but I am too lazy to make lumpia this time coz it takes much time though. Just a lot of work to do! It is very simple to make this, if you have rice noodles and vegies, you can make this for your love ones in just few minutes. You know, I love to surprise and pleased my Babe Dako. So, after very long week of work, he could just sit and relax in the couch while eating bihon plus this is one of his favorite.